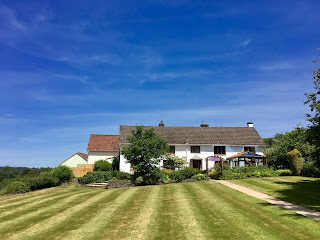 South Farm Cottages offer self catering holiday accommodation in Blackborough, near Honiton in East Devon. These lovely holiday cottages are perfect for fishing and family holidays, and the stunning farmhouse is wonderful for luxurious hen parties. South Farm is an idyllic family holiday destination within an Area of Outstanding Natural Beauty, less than an hour’s drive from both Exmoor & Dartmoor. Guests at South Farm can enjoy stunning views and share the wonderful facilities. 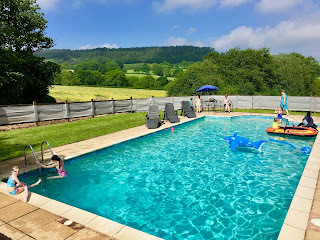 A communal games barn with badminton, table tennis, toys, books and board games is ideal for children to let off steam, whilst adults indulge in a sauna and spa hot tub or use the gym, perhaps even swim in the solar heated outdoor swimming pool after a game of tennis. The grounds are extensive with picnic tables and BBQs available, and there is a childrens' play area with trampoline and play tower. The Farm House contains 5 luxurious double bedroom and 3 bathrooms. Outside there is a large enclosed garden, hot tub, double garage and expansive patio. The house is extremely well equipped, boasting a 40 inch flat screen television with Sky, DVD and stereo player. There is also a connecting door to Oaktree Cottage to accommodate larger parties up-to 16 people. There are also seven self catering cottages, perfect for families. Each cottage is unique but all are well-equipped with all you need for an enjoyable & restful stay. Close to the self catering holiday cottages are three well-stocked fishing lakes. The surrounding fields are where deer and buzzards roam, as night falls you may even see the badger family and foxes that often pay an evening visit.